Kareem Hunt has been working with the Chiefs’ first team. Hunt was one of PFF’s top ranked college running backs last year. 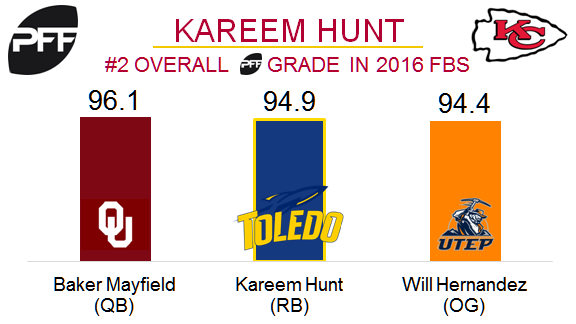 The Chiefs drafted Hunt in third round this year from Toledo, and his 94.9 overall PFF grade in 2016 FBS was the highest for all running backs and second highest of any position. Last season Hunt forced 98 missed tackles, tied for the most in FBS in 2016. His 112.4 elusive rating (measures a runner’s success beyond the point of being helped by his blockers) was seventh among all draft eligible running backs. The Bears are unsure when Kyle Long will return. Long is an integral piece of the Bears’ offensive line but he’s still returning from an ankle injury. Long has been very consistent in his performance since entering the league in 2013 despite splitting time between right guard and right tackle. After a position change back to where he started his career at right guard, he earned a 78.2 overall grade and ranked 27th out of 75 qualifying guards. In 2014 Long had a career season while playing right guard, earning an 83.0 overall grade and ranking as the 12th best guard. The duo of Long and guard Josh Sitton were great in pass protection last season. The pair combined to allow just 17 total pressures while not giving up a single sack in 2016. Both players ranked in the top-15 in pass blocking efficiency and in pass blocking grades. Thomas Rawls and Eddie Lacy are sharing first team reps in practice. Both running backs seem to have a role with the Seahawks offense thus far in the offseason. 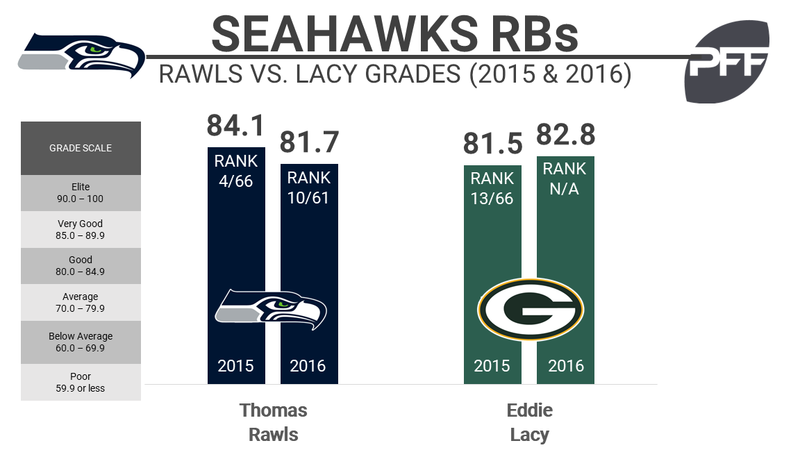 Rawls has been a good find as a UDFA running back in 2015, grading in the top-10 at his position in both 2015 (overall grade of 85.3, powered by PFF Edge) and 2016 (overall grade of 81.7). Lacy has been solid as well. While he didn’t play enough 2016 snaps to qualify for a rank, his 82.8 overall grade was on par with Rawls’ and his 2015 81.5 overall grade ranked 13th. Lacy has shown in the past he can play at near elite levels, ranking inside the top five among running backs in each of his first two seasons with a grade of 89.6 in both. At different points in their career both running backs have shown they can produce yards after contact. In 2014, Lacy ranked third in yards after contact per carry with an average of 2.82. In 2015 Rawls ranked third with an average of 3.12. Brandon Flowers has announced his retirement. The cornerback will end his career after being a productive player for the Chiefs and Chargers. Flowers ranked within the top-10 among cornerbacks in terms of overall grade for four straight seasons from 2009-2012. During that stretch he held opposing quarterbacks to just a 71.2 quarterback rating on 361 attempts into his coverage; he intercepted 14 passes over that span while breaking up an additional 37 passes. In his magical 2010 season, Flowers ranked seventh among cornerbacks by allowing a 65.0 passer rating into his coverage; he was the only cornerback out of the 100 who qualified to not miss a tackle in the passing game (he missed just one tackle all season period, leading cornerbacks with a 65.0 tackle efficiency rating); and he ranked 11th with a 2.5 run stop percentage. 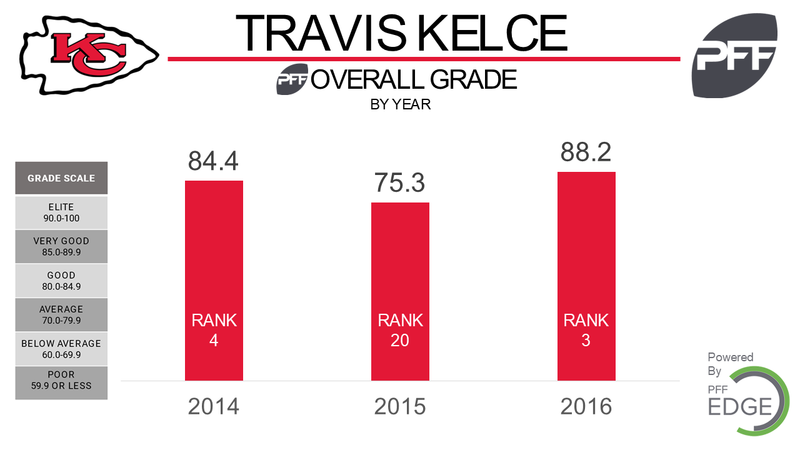 Travis Kelce missed his fourth straight practice. The tight end has been dealing with a swollen knee. The former Cincinnati Bearcat was a weapon wherever he lined up on the field, he’s the only tight end to have over 2.00 yards per route runfrom the slot (2.01) and overall (2.22) in the league. Kelce is one of only three tight ends to lead their team in targets in 2016 (114) and did so with the largest margin between him and the next highest receiver (+33).